Avian Diseases is an international journal dedicated to publishing original basic or clinical research of the highest quality from various disciplines including microbiology, immunology, pathology and epidemiology. Papers on avian diseases relevant to etiology, pathogenesis, diagnosis, treatment, and control are accepted. Manuscripts dealing with avian species other than poultry will be considered only if the subject is relevant to poultry health. The mission is to enhance scientific knowledge and promote avian health. 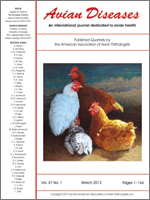 Avian Diseases (ISSN 0005-2086) is the official publication of the American Association of Avian Pathologists. It is published four times a year and contains full papers, research notes and case reports related to the field of avian diseases. This document must be reviewed by all new members, subscribers, and anyone that did not renew their access the previous year. The correct License Agreement Form must be completed and received before online Access to Avian Diseases may be granted. This agreement will automatically be renewed as long as continuous payment of Membership Dues or Subscription Rates are maintained. This Agreement may be modified at anytime and all changes will supersede any prior version. The most current version will be maintained at the link above. The posted subscription rate is for an individual subscriber. Institutions or Multi-Site Applicants can contact the AAAP Business Office for the applicable subscription rate for the level of access desired.